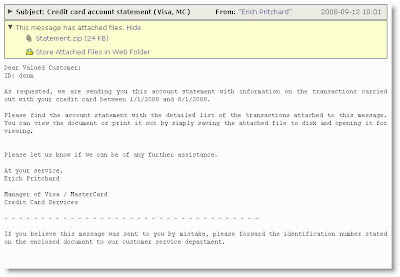 As requested, we are sending you this account statement with information on the transactions carried out with your credit card between 1/1/2008 and 8/1/2008. Please find the account statement with the detailed list of the transactions attached to this message. You can view the document or print it out by simply saving the attached file to disk and opening it for viewing. If you believe this message was sent to you by mistake, please forward the identification number stated on the enclosed document to our customer service department.